“You know, when we are so dependent upon long supply lines – as we are in Afghanistan, where everything has to be imported — it’s much more difficult than it was in Iraq, where we had Kuwait as a staging ground. As U.S. President Barack Obama unfolded a new strategy for war in Afghanistan, one thing became apparent from this unexpected move: the situation in Afghanistan constitutes a primary national security threat to the United States. Thus, for now, it seems that policies based on idealistic notions have given way to more realistic objectives. Small wonder then, that popular utterances, such as ‘success’ and ‘victory’ have been replaced with more sobering terms like ‘stability’ and ‘prevention’ – concepts that were quite familiar during the Cold War era. In a nutshell, security concerns of the administration have ultimately overcome fanciful desires. With such a limited (albeit realistic) aim in mind, Mr Obama has turned to Pakistan, the regional pariah, employing diplomatic tactics such as aid inducements as well as generous offers like ‘strategic partnership’ between the two countries. In return, he demands tough stances, including the blockage of access routes and removal of safe havens of Afghan insurgents in FATA and Pashtun-dominated districts of Balochistan. To bolster this diplomatic campaign, high level U.S. diplomats and military personnel – including national security advisor Jim Jones and the head of joint chief of staff admiral Mullen – paid a series of visits to lay the groundwork. Amidst all this, the row between the military and its civilian puppets over the Kerry-Lugar Bill further deepened when the Supreme Court of Pakistan passed a verdict against Zardari and his disciples. As ever, the army emerged as the sole winner in this internal power struggle and has remained in full-control of the country’s foreign and security policies. With such a dominant position, it is hard to believe that Inter Services Intelligence (ISI) will abandon its proxy, in spite of relentless pressure from Washington. Past evidence suggests that jihadists were never abandoned by Pakistan’s notorious spymasters, even at the height of the U.S. invasion of Afghanistan in 2001. Islamabad did withdraw its military support in the run up to the toppling of the Taliban regime, partly due to sever punitive threats from Washington, but it never relinquished its ties with them. In fact, in the ensuing years, Islamabad not only provided sanctuaries to Taliban deep inside Pakistani territory, but also encouraged them to fight against Western forces across the border. Again, in the face of U.S. pressure, the ISI may ask its surrogates to lie low and wait until U.S. forces withdraw from the region. Nevertheless, U.S. expectations for Islamabad’s full cooperation vis–à–vis Afghanistan are based on a flawed notion: that inducement such as military and economic aid will bring Islamabad into Washington’s orbit. 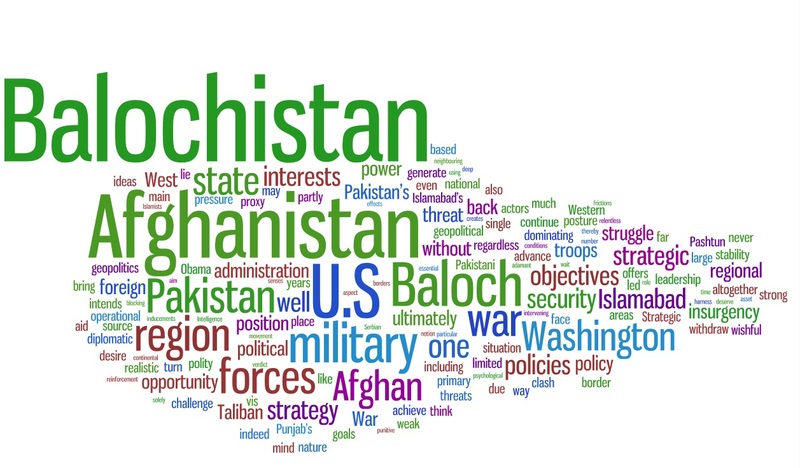 By contrast, Islamabad’s primary objectives are not aid or trade-oriented (although it does expect reimbursement from the U.S., with no strings attached); its objectives are indeed geopolitical in nature – a persistent desire to have permanent place in the Afghan polity. Just as the Second Reich, in a bid to strengthen its continental power, justified its imperial expansion abroad by claiming German peoples’ ‘rightful’ share to have a ‘place in the sun;’ so too, Punjab’s quest to bring Afghanistan back into its sphere of influence is grounded in its expansionist policy which, in turn, is motivated by its geographic insecurity. Faced with Indian might on its eastern borders, Punjab’s survival increasingly depends on control of the Pashtun areas in the west, as well as the Baloch homeland in the southwest. Whether or not, the U.S., by using the sheer weight of its military power, succeeds in breaking the back of the insurgency in Afghanistan, it will, nonetheless, alter the regional dynamics by pushing Pakistan and its proxy back to their heartland, in doing so, it will create conditions for advancing its security agenda in Afghanistan, the benevolent implications on such policy for the Baloch Cause cannot be ignored. The question is, therefore, how far is Baloch leadership willing to go in order to harness this extraordinary opportunity arising from policies which, strictly speaking, were designed by Washington for limited purposes, but that may well indirectly impact the Baloch region too. Having said this, one cannot indulge in the wishful thinking that Western forces will do our bidding by intervening in Balochistan to thwart Pakistani designs. Given, the current geo-strategic position of the West on the world stage, it is unlikely that they will embark on a foreign expedition, even in the face of a crisis with humanitarian dimensions. Nor is it feasible to think that they would open their war chest and put the lives of their soldiers in harm’s way simply to pursue interests that lie at the peripheries. And, yet, it is prudent to think that a large concentration of foreign troops in neighbouring Afghanistan is in itself enough to signal to the Pakistanis to stop their military conducts in Balochistan. The military posture by the West on Afghan soil will surely work as psychological deterrence against Pakistan, which, in turn, ultimately creates an essential space for Baloch forces to improve their operational capabilities and enhance their political control over the region. The most fundamental challenge we face is how to capture the imagination and strategise our priorities to take advantage of the imminent geopolitical shift in the region. Strategic ideas, regardless of their merits, cannot alone generate strategic effects without a firm backing of powerful actors within Baloch political arena; nor can such ideas make any difference when employed by those whose strength rests on mere rhetoric rather than their ability to effect dynamics of the struggle on the ground. Execution of an effective strategy is, however, a collective process which requires the consent of all stakeholders, for instance, weak and strong actors can travel in the same bus, but only the strong can sit in the driver’s seat. In this case, much of the burden rests on the shoulders of the forces we call the ‘Core Group.’ Having established their credibility by investing blood and treasure in this struggle, they remain the backbone and therefore, for this reason, they deserve to have the leading role. At the same time, however, they should ensure that everyone is on board. In short, without complete political harmony over the goals and strategy of the movement among those forces involved, regardless of their strengths and weaknesses, the task of steering the strategy will be that much harder. The situation in Afghanistan, coupled with the activities of Islamists in Pakistan, will continue to be the main source of threat to the West. Therefore, disrupting the insurgency – if not eliminating it altogether – is the main policy goal Washington is determined to achieve by deploying large numbers of troops in Afghanistan. The Afghan insurgency, however, is not solely an indigenous phenomenon; it is, indeed, covertly backed by Pakistan’s military-led spy agencies. Because Pakistan perceives the Afghan Taliban as a long-term strategic asset, necessary to advance its interests in the region, its posture will consequently clash with the U.S. goals to neutralise the threat posed by Taliban. In this fog of conflict, the clash between Islamabad and Washington over competing interests in Afghanistan will continue to generate frictions. The dominant position of the U.S. in the region will also increase Pakistan’s suspicion – that Washington has motives other than bringing stability to Afghanistan. After all, it was the NATO’s Peace-enforcing mission in Bosnia-Herzegovina that became a source of encouragement for Kosovo Liberation Army in its challenge of the Serbian state. It is this uncertain environment that will ultimately create a strategic opportunity for the Baloch to further their interests; and, it is up to our leadership to determine how to wisely plan the initiatives to seize this opportunity which lies at our doorstep.